Well its over a week since my last blog entry and I have had a few messages to check if I had been admitted to hospital! Thankfully that has not been the case - it has been an absolute miracle that I have not caught the bug that has hit Grandpa and B as they are still not quite over it themselves! I still just have a slight head cold with runny nose - nothing more than that and no temperatures ! It have just been feeling really exhausted and I guess not firing on all cylinders. 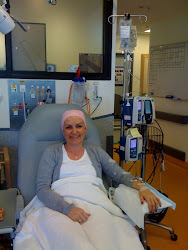 It is hard to believe that next week I will be heading back for my next chemo treatment - overall this one has not been too bad - as I said before the symptoms have been manageable. What I am realising though is that one of the unexpected parts is the isolation it puts you into. A friend I know who has been through breast cancer treatment herself said that it can be a lonely disease! I have been so blessed to have caring people around me and wonderful meals arriving at the door etc and for this I am so thankful but I guess part of the challenge is that for the first 10 days or so after chemo - you are feeling so yuck that interacting with anyone is difficult and then for the week after that your white cell count is so low that you aren't able to interact with many people anyway. In this last week I have missed out on being able to see my lovely friends new baby - the girls had been so excited to go and visit her at the hospital but unfortunately we couldn't go and now we have to wait until the weekend at least before a visit, another friend was having a surprise birthday tea which I had been invited to and couldn't go to either. The laugh about it all is too - that just recently a good friend popped a meal over but I was very tired and a bit cranky when she came anyway. Its a bit of a weird one - you miss seeing friends yet at the same time aren't really up to socialising as you usually would be - so hows that for a chinese puzzle!?! Our home has been a buzz with activity and noise with Granny and Grandpa here and the girls on school holidays - b has also had a fare amount of time at home whilst studying for exams - he however is back to work full-time again this week , Granny and grandpa fly home on Tuesday and the girls go back to school the following Monday. It will all be quite different in the weeks ahead - we are of course still waiting to hear about the exam and visa etc - so never a dull moment. The weather has been a bit grim these last few days - rainy and overcast - perhaps that is affecting my mood. I did also hear some sad news about a contact I have made on the breast cancer network I am part of . It has been such a great way of getting first hand info and tips from ladies who have walked the road a further way than I have - but in connecting in you realise that not every story goes so well. This particular lady is such an inspiration and positive person - it is hard to know that greater challenges are ahead for her and her precious family. You feel so connected to those on the network and want so much to help walk the road together and shoulder the good and bad. I also realise how fortunate I am with my pathology and how thankful I am for the promise of a hope and a future. Well as I write this the sun is breaking through the clouds again - it is always there isn't it - just sometimes hidden from view for a bit !!!! Answered Prayers - A thankful heart ! Just keep swimming, just keep swimming!!!!! Woo Hoo Osso Bucco !!!! !